When George Gillett and Tom Hicks were elbowed out of Anfield by John Henry and Tom Werner it was a day when once again Liverpool fans could start to think about their club making history. A phone-in featuring both owners fielding questions from fans, live on TV, is in its own way a piece of history. 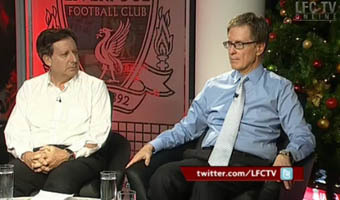 It’s hard to envisage the last two owners being able to sit in the same room as each other, let alone speak on TV together to fans. It’s also hard to envisage the likes of the Glazer family or Roman Abramovich putting themselves in the firing line in such a way. But Werner and Henry did just that last night, on the club’s official TV channel, and deserve enormous praise for doing so. As historic as that was, the kind of history Liverpool fans want to see their club making again is the kind of history that comes with trophies. Liverpool have plenty of that history, but we want more of it, lots more of it, and for many supporters it seems as far away as ever with the current manager in charge. Mixed messages from the manager – he seems to change his mind on a regular basis about how under or over-staffed he is and whose fault that is – don’t fill fans with any confidence. Poor, dated and mind-numbingly over-defensive tactics don’t help either. Especially when the manager talks either side of a defeat about how good all these other sides we’re facing are – even though all but one of them finished below Liverpool in the league just 18 months ago. The reasons Messrs Henry and Werner were in that TV studio last night, indeed the reason Ian Ayre was in the studio with them, go back further than this season. When David Moores ran the club he got it in the neck on a regular basis about the Reds being unable to add to the 18 league titles they already had the day he took control. The reason the club was sold in 2007 was to enable a new stadium to be built, which in turn would bring increased revenues, leading to the club being able to compete financially in the transfer market with its rivals, enabling the club to have a genuine chance of bringing home that nineteenth title. It goes without saying that the wrong owners bought the club, didn’t build the stadium and left three-and-a-half years later with the trophy room as empty as their own wallets. To be fair to them they did see the club finish runners-up in the Champions League in their first few months at the club, although that campaign was waged with players signed before they arrived. In 2009 they saw the club finish runners-up in the league. Hopes were high that the next season would see the club make up that gap between first and second place. Of course as we now know it wasn’t to be. As the 2009 season ended so did the owners’ 18-month finance agreement with RBS. They were told they had to find some cash to put into their ‘investment’ rather than rely so heavily on the loans from RBS. The banks also ensured Christian Purslow (who 12 months before his appointment had been involved with Tom Hicks’ personal search for investment to oust Gillett) was brought in as temporary MD and to find investment to keep RBS happy. RBS were only willing to extend the finance for very short periods of time, on occasions for a matter of just a few weeks, until April of this year when they agreed to extend for six months in return for the owners handing full control of the club’s sale to Martin Broughton. It takes little imagination to picture the turmoil behind the scenes from the end of the 2009 season until the day NESV, now Fenway Sports Group, took control of the club. But now they’re here, now that the in-fighting is quickly being brought to an end, it’s time to ask ourselves “where were we again”? We want number 19, we want number 6 and we want that to be just the start. If we don’t win the silverware we want to look back with pride and admit that we did all that we could in the knowledge we fought and came close. Talk of Liverpool Football Club being “a team that wants to be in the top half of the table” should be banned – and anyone who utters such defeatist words should be banned for daring to even remotely think along those lines. Werner and Henry must know this; if they didn’t then they certainly do now having spoken at length to Kenny Dalglish and his son Paul over dinner last week before spending an evening with the ex-players on Sunday night. Nobody expects them to announce on live TV that the manager is on his way out. But supporters expect them to have privately made that decision already, for them to gracefully ask Roy to move on. The only hold-up should be because they’re waiting for the right manager to come available, not because they think an old dog can be taught new tricks. Roy has spent 35 years in the game but his tactics and philosophies suit clubs who want to try and break into top halves of tables, not clubs who want to be fighting for top spots in tables. Of course finding a manager suitable for the challenge is only one part of the problem facing them, but it’s now arguably the most important part. Reading between the lines, they seem to understand that. Big name manager that can add to the allure of Anfield in attracting top talent? Double check – he’s got a massive reputation as a player too!! Yeah – & he could probably do a better job playing instead of Poulsen! Previous Previous post: What will Henry and Werner be asked by Liverpool fans?